Maulana began by saying that the Muslim world was in need of a Sultan. He said,”We have everything, except a Sultan!”� The Sultan is the most crucial component for the smooth functioning of the Islamic Community, without which, the entire Nation lies crippled and helpless. Why? For Allah sends the Divine support, blessings and help that is meant for the Nation of Muhammad (saw), upon that one, the Imamul Muslimeen, the Khalifatul Rasulullah (saw). It is from that tap that the entire Ummah drinks of the blessings, so if that tap is shut down, no support reaches those who need it. When Heavenly support is cut off, as it is today, look at the condition of Ummatun Habeeb! We are in the worst condition ever in the history of Islam – our beliefs and unity lie in tatters and our honour has been dragged through the mud in shame. Instead of being helmed by one Sultan, the Muslim world has fragmented into hundreds of countries, sects and groups, each being led by one who claims to be a supremely elected leader. When a leader does as he pleases, he follows his whims and fancies, his ego and desires – no Heavenly support descends upon such a leader. The visitor asked a question, and before Maulana answered the question, he explained two facts concerning the asking of questions. Firstly, there were questions that did not bring any benefit, as they contained knowledge that we will never use in our lives. This type of questions are irrelevant to our needs in this world and the hereafter, they merely bring us ‘information’ that have no practical use. Secondly, some questions only bring personal benefit, but does not benefit the entire Community. Such questions are also frowned upon. We must ascertain that the question we ask, is relevant to our journey, and is of benefit to all believers who hear the answer. The most important types of questions are those which benefits the Ummah, the Nation of Rasulullah (saw). A question just for personal benefit, has no value in Allah’s sight, but a question that is seeking a way to collect the hearts of the Ummah under one flag – under one Sultan’s authority and Sultanate – is a blessed question. The visitor, Brother Syed Muhammad, then asked his question. He wanted to know, what it was that Salahuddin Al-Ayyubi had used to protect the City of Jerusalem, for so powerful had this protection been, that Richard the Lion-heart, having gathered all the military power of Christian Europe, and having reached its outer walls twice, was only able to touched it, but was never able to breach the city walls. In the year 1190, Frederick of Barbarossa gathered 100 000 Crusaders, in what is known as the Third Crusade, but they all sank in the sea and drowned. So how did Salahuddin protect Jerusalem? Was it with the use of any verse of the Holy Quran? Maulana replied thus: Jerusalem is a sacred place, it is one of the Haram Shareefs. It was always open to the people of the Book to visit and worship and to visit the Holy Places there. The Companions of the Prophet (saw) who were there, and their inheritors, never prevented the Ahlil Kitab from coming and worshipping there according to their beliefs. No Christian/Jew was ever ill-treated there, none were questioned as to why they came to Jerusalem. Maulana said that the failure of the Crusaders and other invaders, lay in their fraudulent intention. While Salahuddin’s intention was to protect the residents of the city, regardless of their race or religion, the attackers came with the intention to conquer and take Jerusalem under their command, to destroy everything that Muslims held dear, and to shed the blood of every believer there. Millions were killed during these crusades, so many cities were destroyed upon this wrong intention, an intention that was not acceptable to the Heavens. Their intention was not based on any teaching brought by Jesus Christ (whom they claimed to be following), or any other Prophet for that matter. With such a dubious and evil intention (to maim, kill and murder), how can they claim that they were seeking to please Allah? They were not seeking Holy Pleasure of the Lord of Heavens, hence they were cut off from His support and help. Jerusalem will never remain in the hands of cruel oppressors, those occupying it, will never rule it till Qiyamat, it will one day be returned into the hands of believers. Very few have asked this question in the past, and now that it has surfaced, it means that it is time for the Ummah to know these facts. Maulana humbly said that he is but a weak, authorized one to give answers to such questions, and listeners were free to reject the explanation, and to seek an answer elsewhere. Maulana says, he does his best to answer what he is asked (so as to please Allah), and similarly, the Christian Crusaders were told to do their best for their Lord (as taught by Jesus), but instead, they followed the instigation of shaitan, and they aimed to ‘kill, destroy, burn, give trouble to people.’ That was an intention that incurred Allah’s curse and punishment upon them. So many thousands of Crusaders perished in the desert from intense thirst, they were digging in the sand up to their last moments desperately in search of water. Anyone reading history books, from neutral sources even, will see how historians spoke highly of Islamic honour and gallantry, they protected the Jews and Christians under their rule in every era, but when the reverse came to pass, Muslim blood was shed by the millions, by their cruel conquerors. Ironically, the Jews and Christians achieved the Golden Ages whilst being under Muslim rule! That is the reason why Maulana is always praying for the rise of a Sultan, for such a Sultan will bring an end to injustice and tyranny – Imam Mahdi (as) comes, not to spill more blood, but to end the bloodbath that is called the Armageddon, for Islam is a religion of true peace. Look at the example of what happens when evil leaders come into power – the Crusades were led by commanders who inspired and cajoled their followers into a murderous campaign, all in the name of religion! By contrast, when Muslims ruled, they never forced Christians to become Muslims, the Christians were allowed to remain under Islamic rule, and practice their own religion peacefully. Maulana picked out the phrase from the Verse above,�which means, ‘but if ye revert (to your sins), We shall revert (to Our punishments)’ to explain what befalls those who try repeatedly, each time with evil intentions. to which Maulana heartily agreed that when Falsehood ( the Crusaders) came to face Truth (Salahuddin Al-Ayyubi), they perished miserably. Hence no one upholding the flag of falsehood can rule long in Jerusalem, each one will eventually be vanquished. When the guest asked for blessings, Maulana said that blessings are from Allah, it is something that only Allah can give from His Attributes, only Allah can bless His servants. As the session concluded, Maulana revealed that the guest had indeed asked so many people the answers to these questions, and only now was his heart in contentment. Such is the adab of asking questions, where the answers benefit the whole Ummah. All the questions asked by the Companions became lessons for us. The famous oft-quoted hadees of the bedoin who interrupted Rasulullah’s (saw) Friday sermon, to ask about Judgement Day, has become the basis of Sufi journeys! Many people today ask questions to show that they are knowledgeable, or to impress the listener with the depth of their insights and understanding. Others ask questions to test the Shaykh’s knowledge, yet others ask, in order to seek praise from the Shaykh. Ask sincerely, seek answers that will make you a more obedient servant to Allah, seeking to become one whose existence is pleasing to Allah Almighty. Ibn Abi `Asrun continues, “`Abd al-Qadir’s fame became widespread and all that Shaykh al-Hamadani said about him came to pass. There came a time when he did say, “My feet are on the necks of all the awliya,” and he was a reference and a beacon guiding all people in his time to their destinations. The fate of Ibn al-Saqa was something else. He was brilliant in his knowledge of the divine Law. He preceded all the scholars in his time. He used to debate with the scholars of his time and overcome them, until the caliph called him to his association. One day the Khalifa sent him as a messenger to the King of Byzantium, who in his turn called all his priests and the scholars of the Christian religion to debate with him. Ibn al-Saqa was able to defeat all of them in debate. They were helpless to give answers in his presence. He was giving answers to them that made them look like children and mere students in his presence. His brilliance made the King of Byzantium so fascinated with him that he invited him to his private family meeting. There he saw the daughter of the King. He immediately fell in love with her, and he asked her father, the King, for her hand in marriage. She refused except on condition that he accept her religion. He did, leaving Islam and accepting the Christian religion of the princess. After his marriage he became seriously ill. They threw him out of the palace. He became a town beggar, asking everyone for food, yet no one would provide for him. Darkness had come over his face. 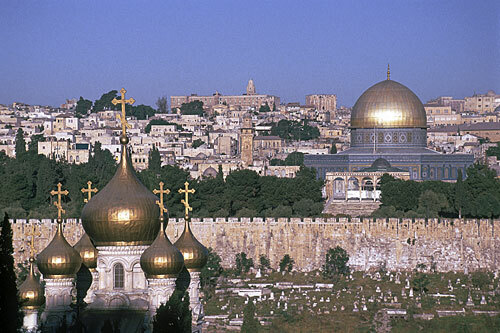 The intention to desecrate Holy places is unacceptable to the Heavens, hence the failure of the Crusaders. The desecration of Holy places and tombs in Makkah and Medina, has also drawn the ire of the Anbiya and Awliya. Look what befell the people of Prophet Sayyidina Salih (as), when they killed the Holy Camel that Allah had sent them – they were annihilated by a massive earthquake. A similar fate awaits those who disrespects Allah Signs and Holy places. Rasulullah (saw) said, “Every action is judged by its intention.” Maulana Shaykh Adnan always ends his Suhbahs with this doa, “Oh Allah, have mercy upon us, Oh Allah, makes us sincere ones to You, to Rasulullah (saw), to our Shaykh, to Sohibul Zaman (as) and to Sayyidina Isa (as).” May Allah makes us from amongst the mukhliseen (sincere ones). Ameen. This 21 minute Suhbah in English can be viewed only at www.Saltanat.org. Choose from the menu on the right, “Jerusalem 19.Dec.2010”. There is a CC button next to the Volume control at the bottom of the screen to choose choose subtitles in eleven languages, choose from Arabic, Bahasa Indonesia/Melayu, German, English, Spanish, Italian, Russian, Mandarin, Dutch, Italian and Turkish. Click the AD button at the top right-hand corner of the display area, for a live translation into English. During Live Suhbahs, the buttons at the top provide Live Audio Translations into other languages as well. Should the video no longer be there, please look for it under the video archives of the Saltanat TV site. This entry was posted in Maulana Shaykh Nazim's Suhbahs and tagged ikhlas, Mahdi, Question, Sincerity, Sultan. Bookmark the permalink.